By no means wild and unusual, but perhaps best described as unconventional. Unconventional pairings, unconventional methods, unconventional presentation. Translucent succulent hirame sashimi topped with generous truffle shavings, plump yet velvety uni, and a tummy-warming seasonal croquette all make you want to come back for more. One thing is certain, even if it’s your first time dining here, the chef makes you feel like you are one of his regular customers. That is the level of comfort and approachability you get at Sushi Ryusuke. Always one for a challenge, Chef Yamane chose Ginza for his first foray as an owner/chef because he feels that if you can make it there, you can make it anywhere. There is so much choice in Ginza, especially in the finest sushi, but he felt sure he could bring something new to his customers. The somewhat dark staircase brings you to a simple sliding door which opens into a light, clean minimalist Japanese space. The soft refreshing aroma of the seven-seat counter – a single plank of hinoki – invites you to take a seat, leaving your shoes on. And there’s a small nook for your bag in front of your knees. It’s the small touches like this that make the space so welcoming and comfortable. Try the mixture of unconventional and traditional. The cuisine here is all about showcasing the best in Japanese seafood, alternating cool and warm dishes, sushi and otsumami, new combinations and comfort-style food. Yamane finds inspiration for new creations in the wide variety of washoku that he enjoys every day. 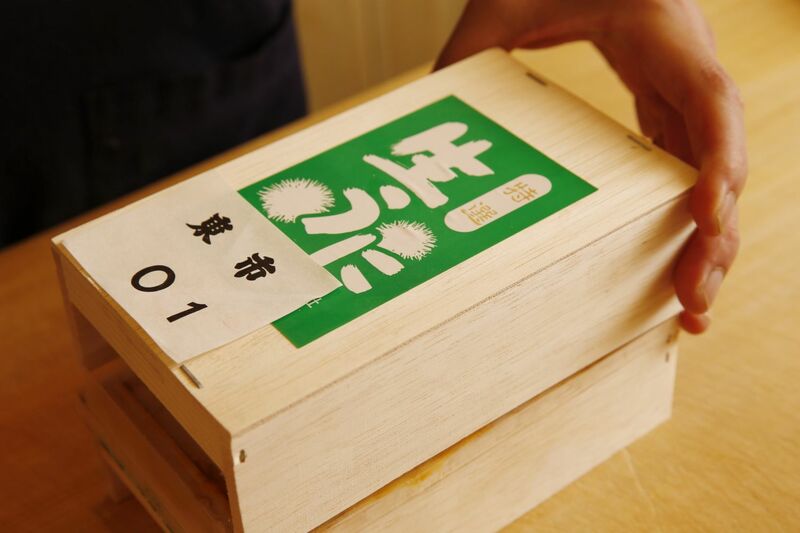 He tasted countless varieties of rice for texture and flavor before finally settling on the Yamagata-grown Akita Komachi variety. 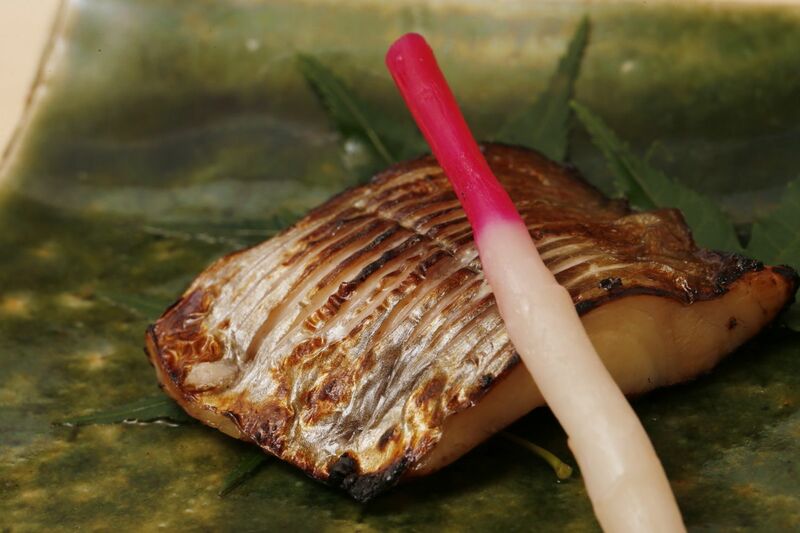 It is flavored depending on the fish that will top it – either a single white vinegar or a blend of three red vinegars from Yokoi Vinegar Brewing, a long-trusted brand in the world of Edomae sushi. 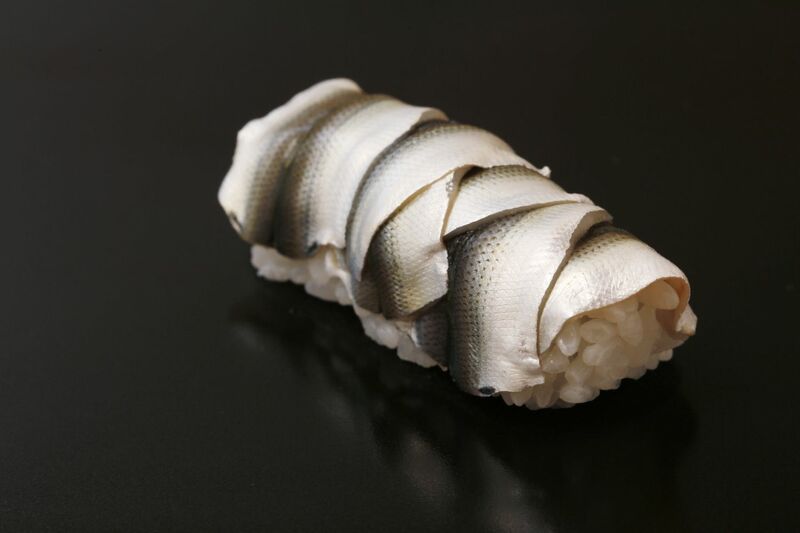 Dark fish, white fish, six baby fish layered delicately and glistening with freshness – the chef serves with a rhythm that soothes and satiates. While your taste buds will be tantalized by every dish the chef presents you with, there is one that will compel you to make a reservation for your next dinner before you even finish this one. Flounder with shaved truffle. With your appetite already stimulated by the aromas that waft during preparation, then you taste it. Flavor and texture like no other. 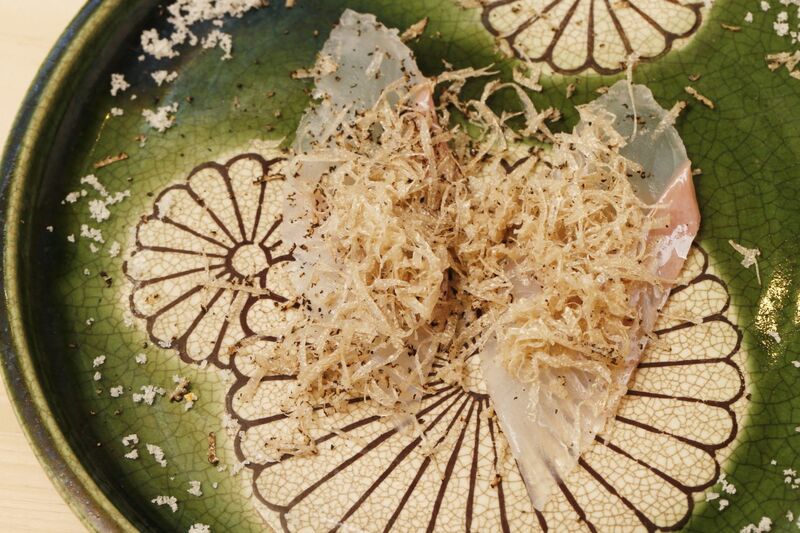 The perfect temperature of the fish, topped with generous truffle shavings, and garnished with truffle salt so delicious that you will be following it around the plate to scoop up every last crystal. You will also be treated to grilled dishes of large creamy meaty slices of abalone or sumptuously marinated ebodai Japanese butterfish, seasonal variations of velvety chawanmushi savory egg custard, and a rich creamy deep-fried croquette filled with crab, scallop or even squares of truffle depending on the season. 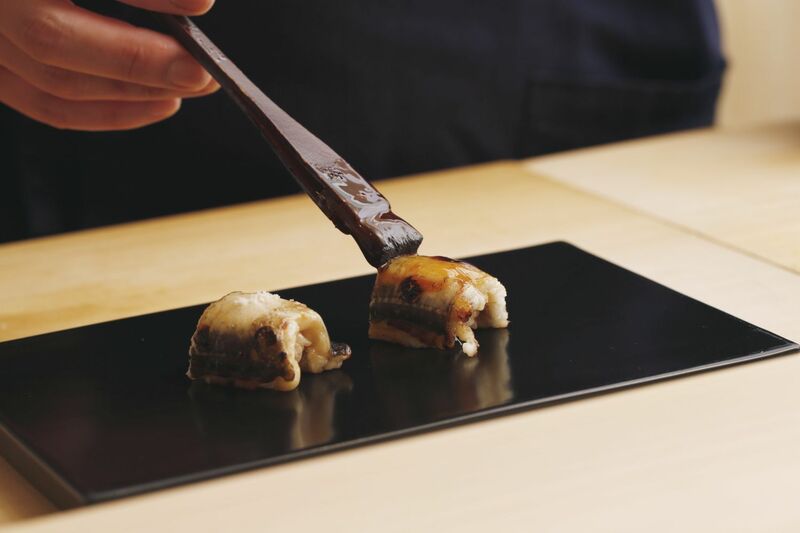 A generous fleshy serving of anago from Tsushima in Nagasaki is charcoal-grilled and served two ways – with salt and swift brush of sweet tare sauce. 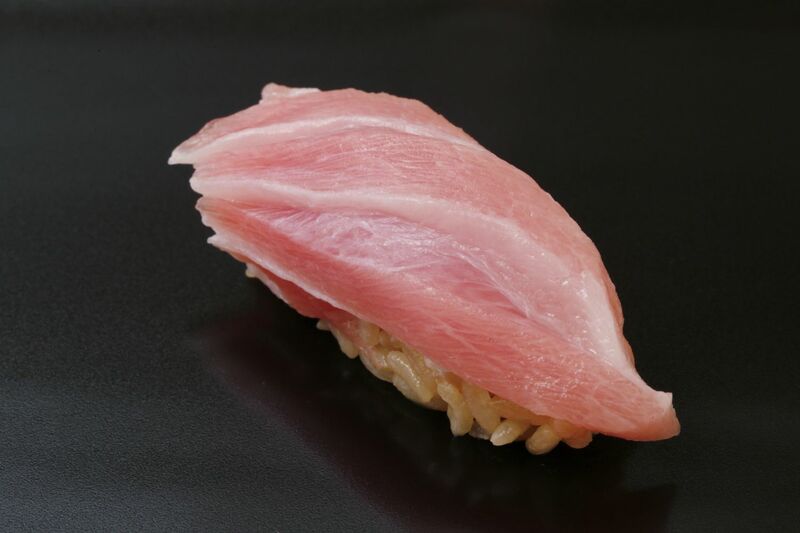 It’s fluffy and crispy at the same time – a texture Yamane achieves by brining it overnight. You may notice a distinct lack of condiments like soy sauce and wasabi on the counter. This is because the chef has already precisely flavored each component, enhancing their flavors and eliminating the need for wasabi or soy sauce. And ginger will only make an appearance if it’s the right moment to cleanse your palate for the next course. When you work for a big sushi establishment, orders are made by telephone with specified suppliers who deliver all your ingredients. Now that Yamane has gone out on his own, getting to visit Tsukiji market every day is what he looks forward to most of all. Interacting with the fishmongers, selecting product with his own eyes – this is fun for Yamane. Clearly he has forged some excellent connections at the market. 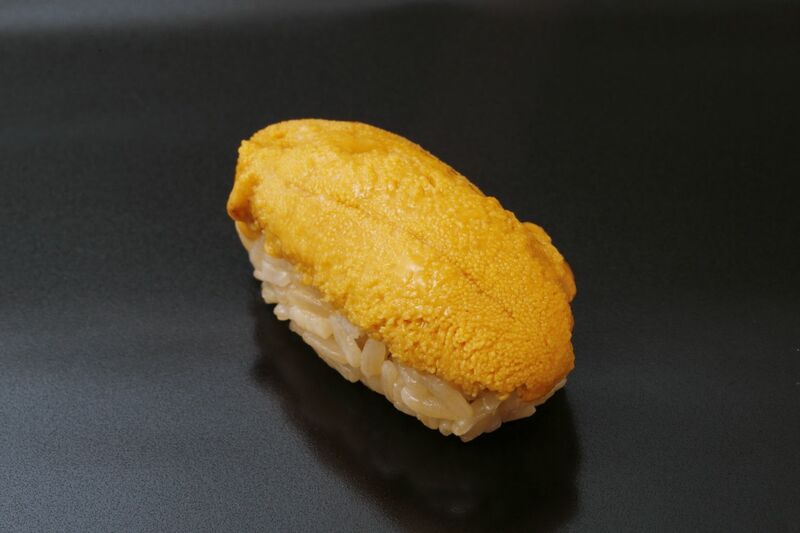 This becomes clear when Yamane pulls out a small rustic brown bag of uni labeled ‘01’, indicating this sea urchin as the highest quality product at the auction that day. 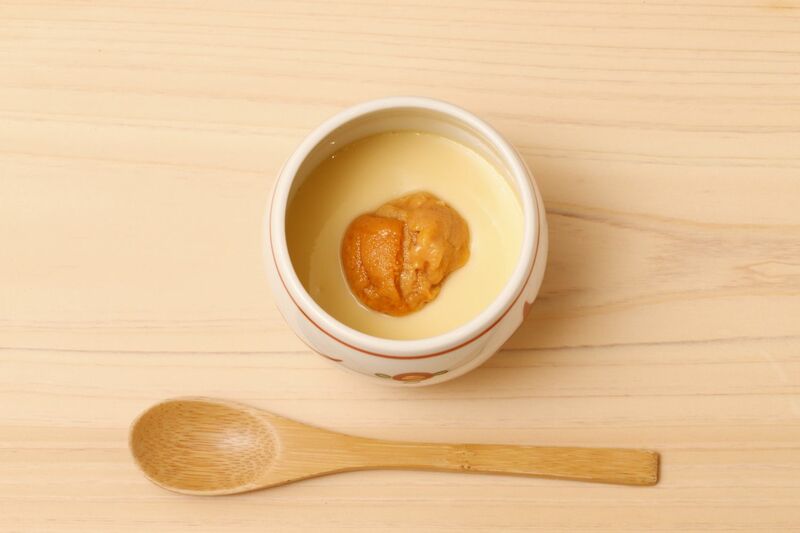 And when the sweet velvety uni is this good, Yamane showcases it as a standalone dish. 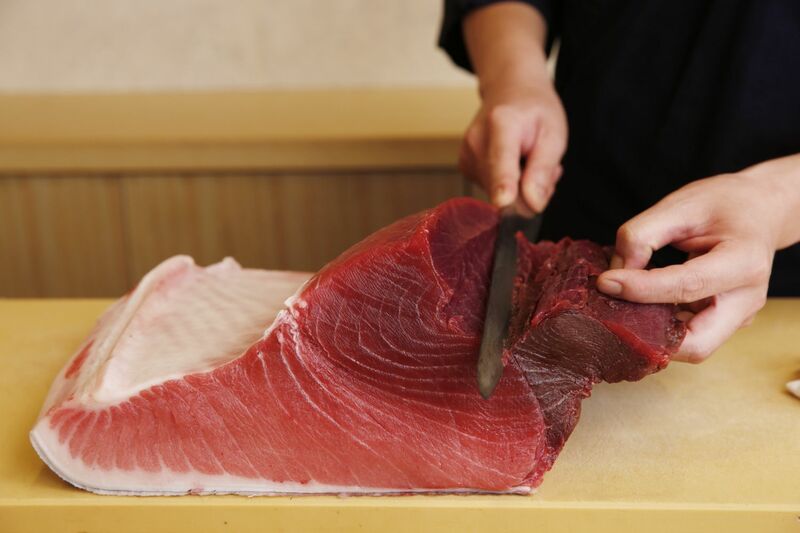 He also takes great joy in breaking down a whole block of tuna, feeling for the right place to make a cut, making meticulous little movements with his knife to create the perfect pieces. It is awe-inspiring to watch this knife-work, almost like an orchestra conductor flicking the baton. 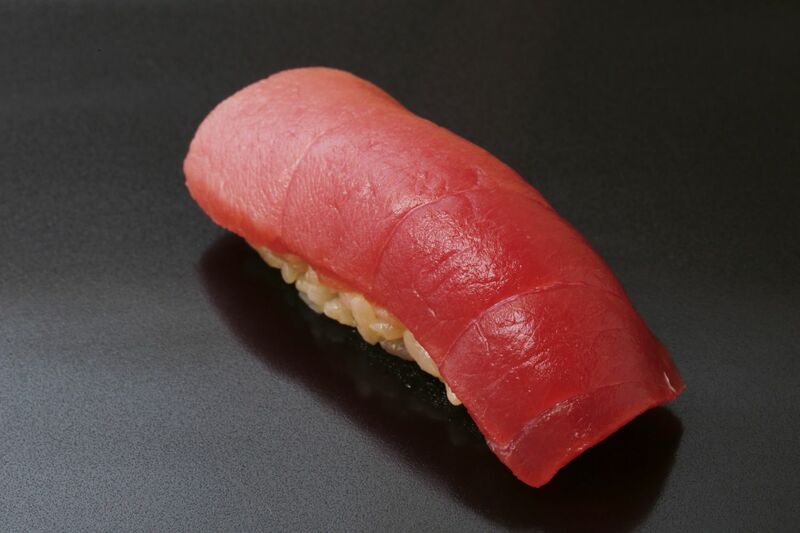 Yamane prefers maguro on the small size (around 70-80kg), because while larger ones have more generous layers of fat, the distinctive flavor dissipates. Yamane really focuses on the fresh flavor and for the most delicious flavors, you absolutely have to get the product at its peak. Chef Ryusuke Yamane was born in Chiba Prefecture. His childhood dream was to become a sushi chef. He is not sure what influenced this mindset – perhaps it was an uncle who owned a western-style restaurant or his dad who used to take him fishing. A proud grin comes across his face when he tells us about the time his children came to dine at his sushiya. He takes Sundays off to enjoy family time with them. As a child, sushi had been his favorite food but his version was not quite this luxurious. Reluctantly finishing high school, he went on to cooking school focusing on washoku. For the practical component of his study, Yamane was assigned to the Chiba Sogo department store location of Kyubey – one of Ginza’s most famous sushi restaurants since 1935. He was hired by Kyubey at the completion of his education and worked in Chiba for seven months before moving to the main location in Ginza. Under very strict and unyielding tutelage, he worked his way up from cleaning and odd jobs to being allowed to chop the heads off fish by his second year, not breaking down a whole tuna until his fifth year. Finally in his sixth year he was permitted to stand before the customer shaping sushi creations for them, serving at several Kyubey hotel locations. Even this is relatively early in one’s career as a sushi chef to serve directly to customers, which shows the trust and promise Yamane’s superiors saw in him. Always maintaining his sleek bald bozu head in the name of fastidious cleanliness, Yamane sought different experiences, working at various sushi restaurants in Tokyo and Hokkaido. 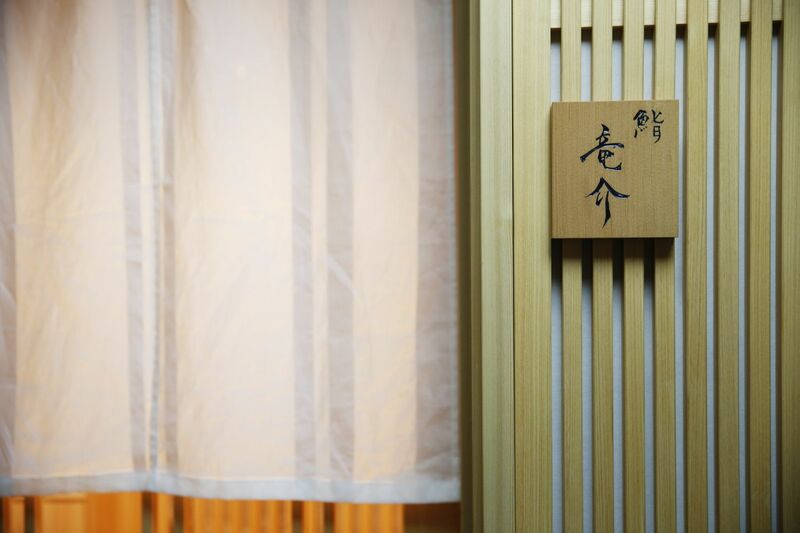 During his time as the oyakata, he helped Sushi Ichi in Ginza earn its first ever Michelin star. The biggest lesson Yamane has learned from his many years as a sushi chef is that over time anyone will be able to prepare sushi. But the real challenge and satisfaction in the job comes from genuine customer interactions and gaining customer trust. This, too, he has mastered. Yamane is friendly, softly laughing as he chats, always making good eye contact. He wants you to relax and enjoy your personal experience, not needing to fit into any rules or restrictions. This may also explain the expansive liquor selection starting with a large lineup of nihonshu, including the current hit Dassai and varieties from Hirakou Brewery in the tsunami-hit town of Ishinomaki, including Hidakami Daiginjo with a surprisingly mild bouquet that lends itself to slow sipping and enjoyment with a meal. If you like wine, you can have Chablis, Cloudy Bay Sauvignon Blanc or wines featuring the native white table grape called Koshu. These and the lovely Asatsuyu from Kenzo Estate are particularly good with the otsumami dishes. There is also red wine and champagne, and lastly you will find a large selection of Yamane’s libation of choice – whiskey – with Japanese varieties like Chita and Yamazaki, Socttish Ardbeg and Scapa, and other brands from around the world. Going forward, Yamane jokes about just wanting to pay off his debts. More seriously, he really hopes to cultivate more and more sushi chefs, always exposing his staff to a whole spectrum of tasks, so they are trained and ready to take on any role. But then he comes back to his main point about customers being the central piece in the whole dining experience. Because Yamane’s goal is to give customers the experience they wish to have, he wants to really observe and build relationships with his clientele. 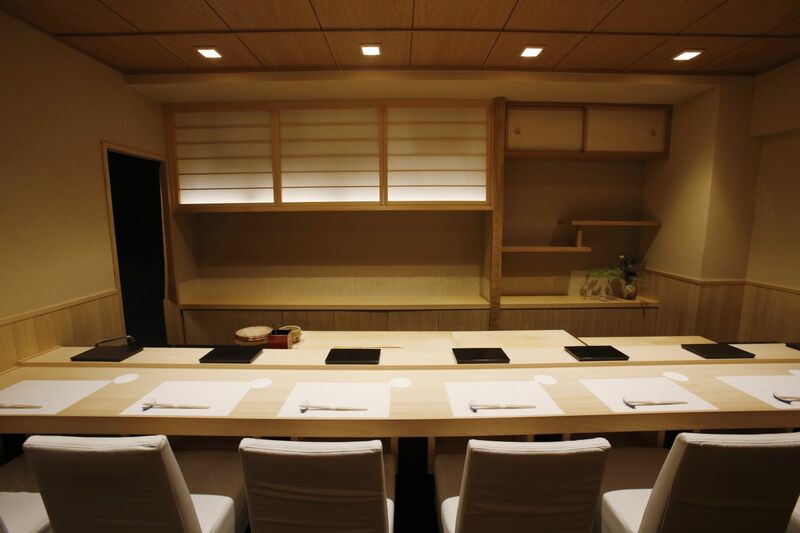 That is why it feels so right for him now in his perfectly intimate seven-seat sushiya tucked away in Ginza. At first it seems Chef Yamane is not a stickler for anything – his knives just need to be sharp, customers choose their own libation from a wide range of high-end varieties, and you are free to stay and relax well after your meal has ended. Then you realize that is his point. The focus is on the customer being free to create their own experience around their personal preferences. This is the essence of what makes dinner at Sushi Ryusuke so enjoyable. 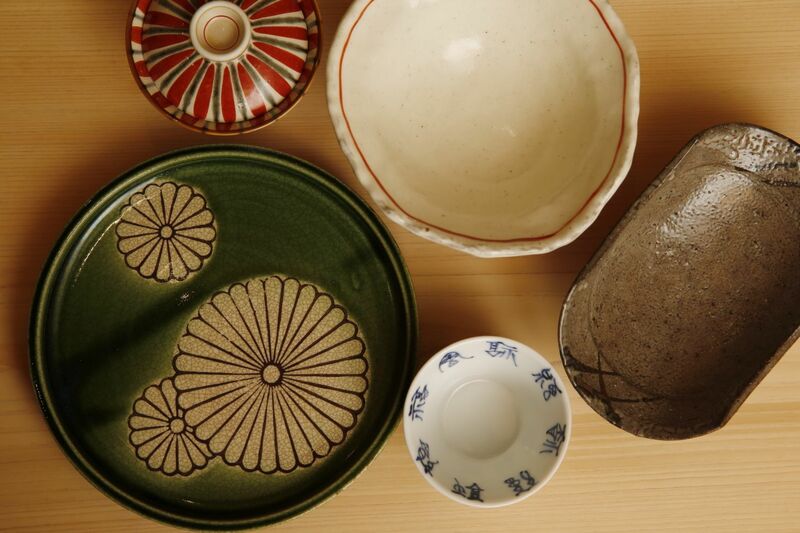 Yamane selects various dishes for size, balance and weight through a specialty tableware dealer based in Tsukiji called Toshudo. All dishes are fired to order. He has no rules about certain foods served on specific dishes – he takes it one dish, one customer, one moment at a time. A beautiful thick yet elegant green chrysanthemum dish; a sandy colored dish textured with ripples like it has been shaped with the waves of the ocean. 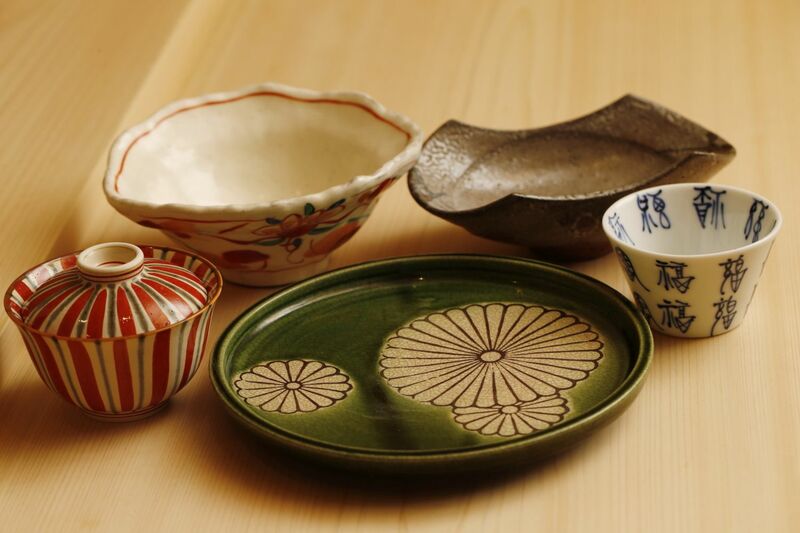 Yamane is especially taken with the dark green glaze reminiscent of green tea found in pieces of Oribe pottery from Gifu Prefecture and the dark, rugged contours of Bizen ware from Okayama. Open For Lunch. For Dinner 2 starting time: 6:00PM and 8:30PM.